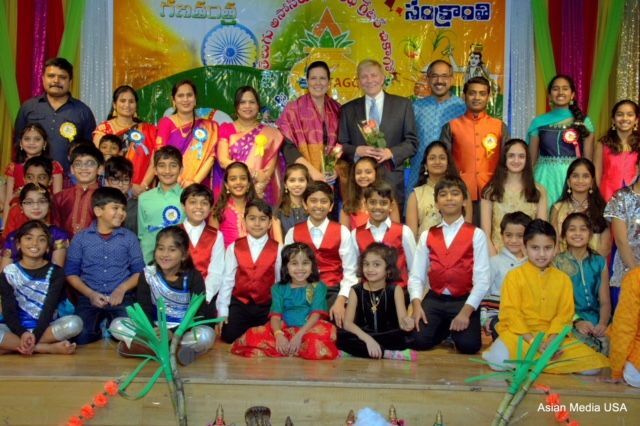 The First Telugu association in North America, TAGC- Telugu Association of Greater Chicago celebrated Makara Sankranti and India Republic Day with Chicago land area Telugu families at the HTGC Rama Temple Auditorium, Lemont IL. The event was a grand success with an overwhelming response from the Telugu community with over 1000 guests in attendance. The event was conducted on 13th January, 2018 from 3:00PM to 10PM. 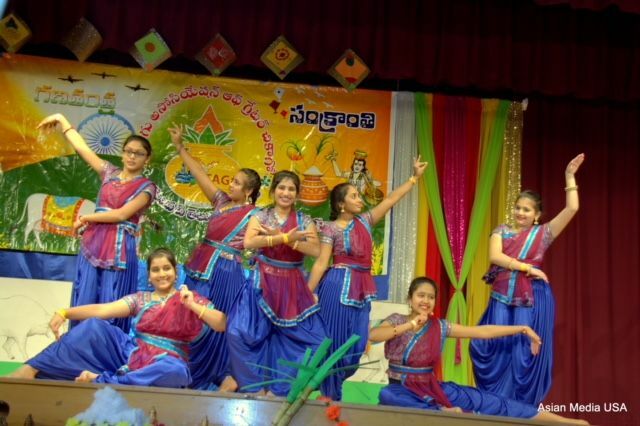 TAGC Board has decided to do this event with all local talent promoting the Telugu culture, traditions and encouraged youth to preserve traditions. The response from the Telugu community was tremendous as per Membership committee chair Mr. Praveen Vemulapalli more than 1000 guests were attending the event even during the Cold climate in Chicago. On behalf of all TAGC, We wish all our community a happy Makara Sankranthi and advanced Republic Day wishes. The cultural programs included more than 30 programs with 330 local talents, followed by Chicago famous singers Praveen Jaligama garu, Sailaja garu and Madhavi Merugu garu who entertained audiences with different movie songs. TAGC President-elect Ramu Billakanti garu welcomed and wished good health, prosperity and wealth to all the guests on behalf of President Jyothi Chintalapani garu. President garu thanked all Sponsors, Volunteers and encouraged to take membership by all attendees. 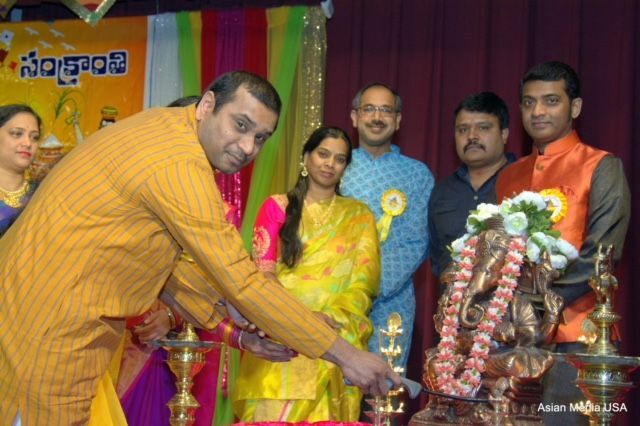 The program started with Lord Ganesha prayer along with the cultural team and Board of Directors. In the Sankranti and India Republic cultural event 330 participants performed a variety of programs and shows keeping the audience entertained and involved. 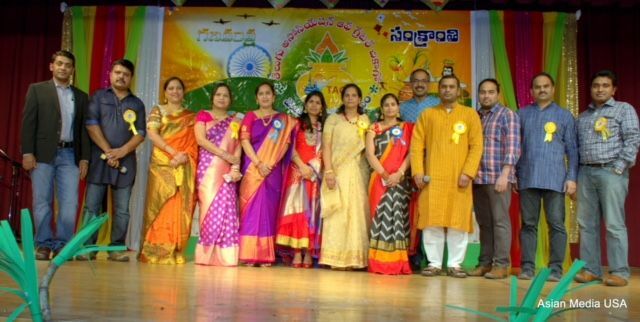 The program highlight was 36 person Fashion show, Men's skit 'Pandu gadi Kotu Gola' and Women's skit 'Mahillallu ' Maharanulu' TAGC President elect thanked and congratulated Cultural Committee Chair Ranga Reddy Lenkala Co- chair Swetha Janamanchi and Uma Avadhuta along with Madhavi Konakalla, Madhavi Kondam and coordinators/volunteers who worked for more than 8 weeks to make the event grand success. Audience was enthusiastic to see all decorations throughout the Auditorium. Bommalla Koluvu, Kite decoration, Harvest Crop themes was a special attraction according to Decorations Committee Chair Mrs. Vani Yetrintala. There was also competitions on Sankranthi theme and Muggulu potti. Gifts were distributed for the Competition winners by Sponsors along with on-spot gift cards for kids who answered correctly about Sankranti and Telugu culture. TAGC Sankranthi cultural Celebration also included delicious dinner served by Volunteers. In food "Ghee Ariselu" became the top attraction, which was specially brought from India. Along with Ariselu, more than 10 items were served which include Pongal, Indian Peas curry, Vada and Pizza for kids. Volunteer team led by Food Chair Mr. Srinivas Kandru has streamlined the process and made the lines disappear with minimal wait for more than 1000 guests within an hour. TAGC Board thanked Bawarchi restaurant for providing a tasty food with lot of varieties for a nominal price. All the board members, various committee chairs/co-chairs, volunteers under the direction of the current President Mrs. Jyothi Chinthalapani, President-elect Mr. Ram Billakanti worked hard with dedication, passion and great enthusiasm to make first event grand successful and memorable with festive experience to guests and participants who attended the event. Youth Volunteers helped in the event in membership validation, ticket distribution and Food serving. All the event was driven by volunteers and did a smooth execution.